I am more than happy to write to you about our trip to Italy. My family and I had only one complaint, so let's start there. In Florence, we didn't much care for the Orto de Medici hotel. I suppose it's because our first experience at The Lancelot hotel in Rome was so good. The family that runs the Lancelot goes out of their way to make their guests feel at home, and there is much to do right at the hotel when one comes in at night after a day of exploring the city. It is easy to have a glass of wine at the bar and mingle with other guests. At the Orto de Medici, that was not the case. They did have a very nice library with a large flat screen television and easy computer access, but no place to grab something to drink in the hotel. The other thing that disappointed me was the way my request for tickets to the Acadamie D'arts Museum in Florence was handled. I stood at the front desk and requested four tickets, standing there with my walker before I headed to the elevator. The desk clerk called up to the room and said he was able to get 4 tickets, but he charged us 4 full ticket prices. If he is on your accessible hotel list, he should have known to not charge me or my husband. This was an oversight that wasn't noticed until we got to the museum. The person taking our tickets told me that I shouldn't have paid for two of them. That cost us 26 Euro too much. Oh well, I should have remembered and the desk clerk should also have known. If we ever return to Florence, we will choose a different hotel. Laura, everything else about our trip that you planned was well above anything we could have expected. You and your company did an excellent job of providing for us a very special vacation that we will never forget! Enzo, our driver in Rome and the Amalfi Coast went beyond making us comfortable. He actually walked us to the EuroStar train to Florence, and loaded our luggage and my walker on board for us! I will never forget what a professional he was. His driving was excellent and he put us at ease right away. Judy, our tour guide is another person that we will never forget. Just a lovely person and full of so much information that we felt as if we truly understood the history behind what we were seeing at the Vatican Museum and all that followed. Taking the train to Frosinone was a great idea that you had. It saved us much time and money and my husband's Aunt and Uncle picked us up from the train station and took us to their home in Chiaiarmari for a day filled with lots of food and lots of fun. As for Venice, the four of us were met at the train station by Danielle and Angelo and loaded on to a boat for our own private use that took us to our hotel. They had a "rickshaw" type seat with long handles to carry me aboard. The next morning these same two gentlemen, along with a tour guide took us on a tour through the canals of Venice and even to Murano. Piazza San Marco (St. Mark's Square) is everything we imagined it would be. 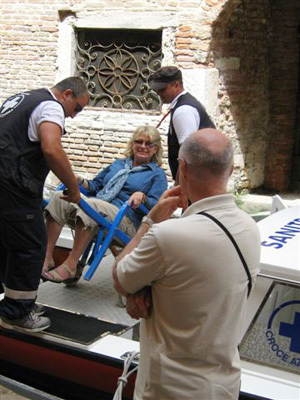 Thanks to the detailed plans of Laura, and the people at Accessible Italy, we were able to enjoy all of the magic of Venice. I could go on and on, but I want to sincerely express my gratitude to you for helping to make this a trip of a lifetime for us. Spending that last two days relaxing at the Hotel Florence, in Bellagio was perfect. What a lovely hotel and wonderful breakfast. Fresh croissants and they even had scrambled eggs and bacon. Something we hadn't had since we left for Italy. By the way, I also want to mention that at The Lancelot in Rome, we met another family that you have put a trip together for. Kris, Connie and Scott Kiefer. They were very nice to talk with. One more thing I would like to ask. Do you and your company put together these same kinds of tours for able body people? After seeing our pictures and hearing about our experiences, some of our friends are already asking us about Regency San Marino, srl. Please write back to let me know that you got this email, and to ask anything else that perhaps I haven't made clear. Laura, I am still in awe of everything that we were able to see and do during our two weeks in Italy. Again, thank-you. The trip was great. We all had a great time. Everything you set up for us was perfect. Everyone was very professional and all the guides were fantastic. We saw everything we wanted to. We had only one question which you may want to relay to future clients and that is what is custom for tipping the drivers and the guides. We had the package price so I had no idea what the drivers and guides were getting for there part so we kind of guessed with the amount to tip them. You may want to recommend to future clients what would be an appropriate tip for each. We loved the trip. I have a 15year old daughter in a wheelchair and when she gets old enough I would love to take her to Italy ! I will be sure to call you and I will recommend you to anyone who asks. I'm VERY impressed with this page and form of communication in general – it's VERY professional and friendly – thank you!" "Thank you again for collecting the information and putting this amazing page for us. Thank you very much for your information and congratulations for your web. You help us to do our life more easy. MARIA Thanks again for your assistance. We had a fantastic experience! !